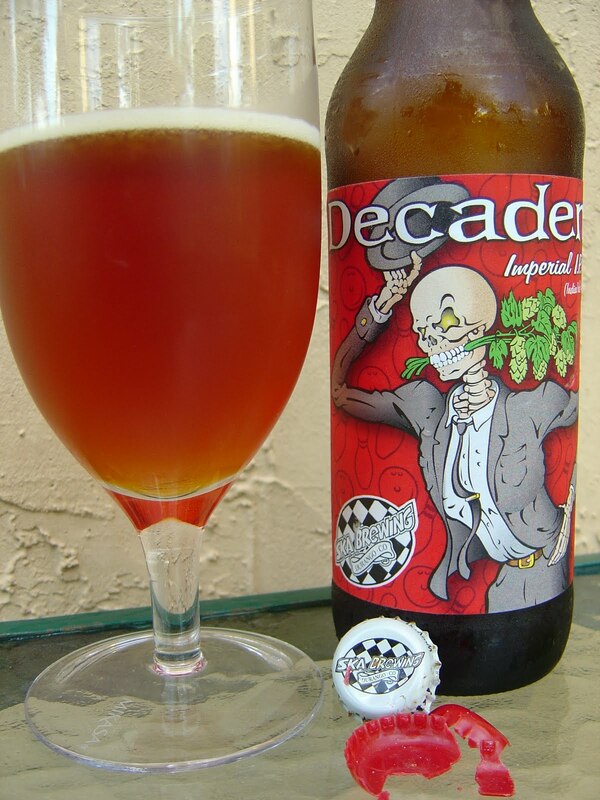 Tonight I'm drinking Decadent Imperial I.P.A. 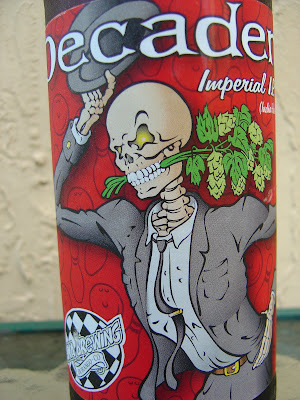 brewed by Ska Brewing Company in Durango, Colorado. This handsome 22 ouncer came back from my friend's recent trip to Denver. 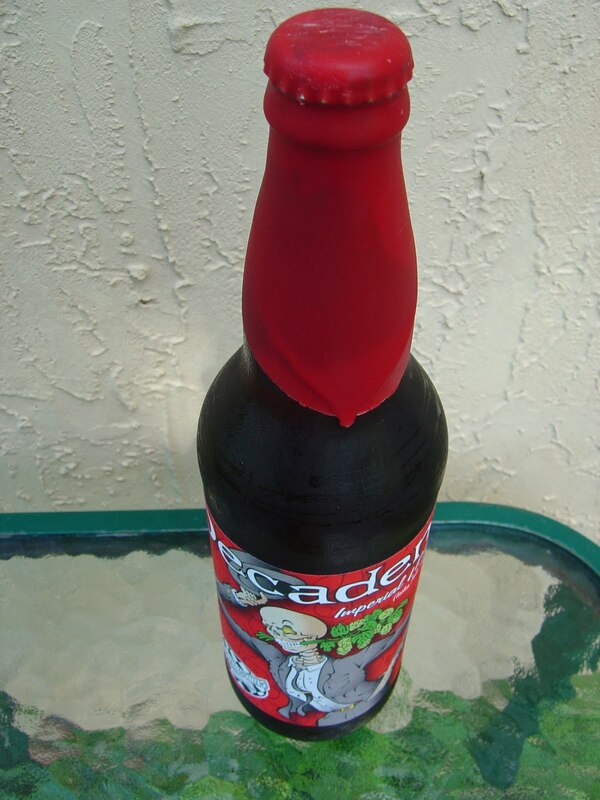 First, the bottle cap and neck were dipped in red wax making for quite the elegant presentation. The label depicts a skeleton in a suit with a branch of hops in his teeth, and I must say his dental work is still quite nice, for a dead guy. Speaking of dentistry, any of you local people know anything about orthodontics or can you recommend one for me? My kid needs some braces and I really like the dentist I have, just don't like his prices. Need a comparison. OK, tangent over. This is the first beer I've had from this brewery. I've connected recently with Ska Co-Founder David Thibodeau on Twitter, too. 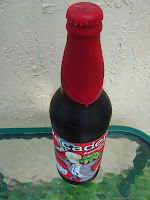 He told me the other beer I received from the same trip, Dementia, only had 90 cases bottled. Score one for the beer traveler! I doubt many of those will make it to Florida! That review will come soon. Hey GABF-bound pals, check these guys out when you get to Denver! Just wait til you try the Dementia, I gotta say it is something else...a pale ale aged in Bourban Barrels??? I am sipping on it as I type and enjoying every second of it. As you know (since you got it from my store) I have some access to it and have put another one away for myself to do a proper review on my blog. We got another in from Ska today that is in the Local series "Hoperation Ivy" and a DIPA from Left Hand called Twin sisters...maybe we can work something out where you can get me some east coast brews. Hey Ales. Thanks for stopping by. Yes, thanks so much from you and your coworker for helping my friend make some good beer choices. Can't wait to try Dementia. I've done a few trades in the past, though I wouldn't consider myself an active trader. We have some Cigar City beers which you likely don't have. St. Somewhere.